A good beef roast always makes for tasty leftovers. For that matter, so does pork. And if you want to take a walk on the wild side, consider venison or elk. Another meat that ranks right up there is buffalo or bison. I know this for a fact because once or twice a month we cook a bison roast, which we purchase from Siouxland Buffalo west of Grand Forks, N.D. Most of the time, I just place the roast in a Dutch oven with some potatoes, carrots and an onion, along with a little red wine and water. I’ve also sliced a roast and made Swiss steak. But I tried something new Sunday. I cooked a 4 1/2-pound bison roast in a 9-by-13-inch baking dish, the same way we did up a chunk of prime rib beef on Christmas Day. I placed the meat, which had a healthy coating of Applewood Rub — one of several rubs made by McCormick — and four strips of bacon in a oven preheated to 475 degrees for 1 hour. At that point, I lowered the temperature to 300 degrees and proceeded to cook the roast another 30 minutes or so. The internal temperature was about 140 degrees, which and gave us juicy meat that was medium (a little pink in the middle) to well-done. 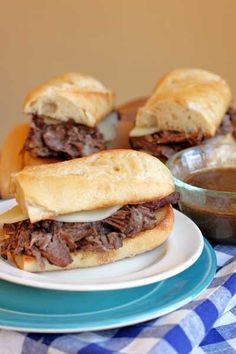 I had placed about a cup of water in the baking dish at the start of cooking, and that combined with the juices from the meat, it provided a great au jus. And that’s where the leftovers come in. We’re planning on thinly slicing the remaining roast and placing it and some Provolone cheese on a baguette for dipping in the leftover au jus, which has been enhanced with a little Worcestershire sauce. 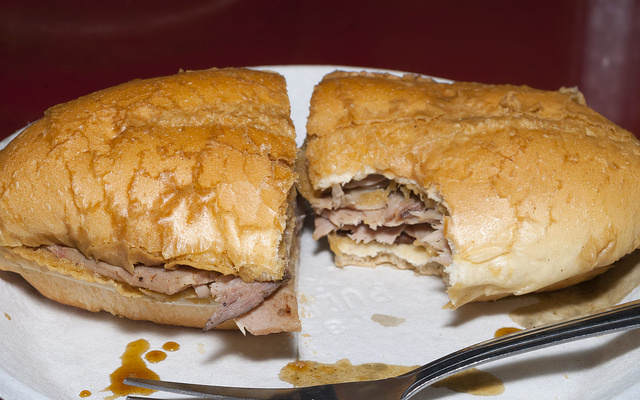 French dip sandwiches don’t get any better than this!